Damage from Friday’s 7.0 earthquake in Southcentral Alaska has rendered parts of the Alaska Railroad system north of Anchorage “impassable,” indefinitely shutting down train service between Anchorage and Fairbanks, an official said Saturday. 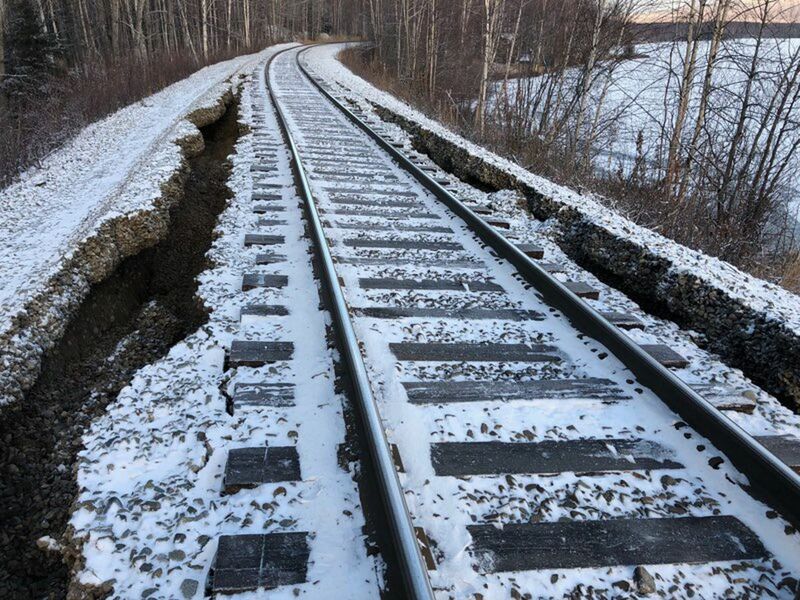 Tim Sullivan, an Alaska Railroad spokesman, said in a statement that the railroad had identified at least three areas to the north damaged by ground shifting, cracking or sloughing. At one spot near Nancy Lakes, in the Matanuska-Susitna Borough, crews reported cracks 2 and 4 feet wide and between 100 and 150 feet long on each side of the tracks, Sullivan said. Sullivan said work crews will be heading out with heavy equipment in the next few days to fill and repair the damage. “Since we are not done with inspection of all of our track and bridges we do not have a good estimate of when we will be up and running between Anchorage and Fairbanks,” Sullivan wrote in the statement. Trains south of Anchorage to Portage and Whittier were expected to begin running first thing Sunday morning, Sullivan said. He said crews were working Saturday to inspect and clear those tracks. He said the railroad was also spending Saturday cleaning its facilities in Anchorage. A pipe burst in the railroad’s Anchorage Operations Center, causing major damage, Sullivan said. He said it will take extensive work to repair the building and make it fully operational. The Anchorage Historic Depot and most other railroad facilities had only minor damage.